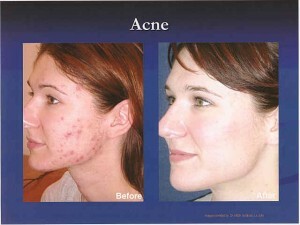 Acne TreatmentThere’s no reason to suffer with acne. If you have acne, it can be embarrassing and lead to low self esteem. Without treatment severe cases of acne can be disfiguring, leaving permanent scars. New techniques are available to treat acne and minimize outbreaks. Acne is an equal opportunity condition, afflicting teenagers, young adults, and occasionally even more mature adults. Blue Light Acne Treatment uses light – without drugs or antibiotics – to treat hard to control acne, including acne vulgaris. 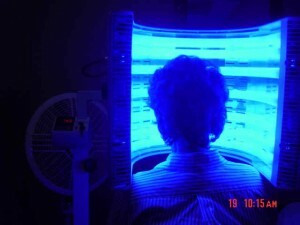 The special blue light kills the p. acnes bacterium that grows inside clogged pores that swell up and form pimples on the skin.Blue light treatments involve sitting with your face close to the light for a short time (typically 8 to 16 mins 40 secs) about once or twice per week for a period of about five weeks or so. The procedure is safe, not painful, and not hot. Over the course of the treatments, many patient may experience noticeable control or clearing up of their acne for a very long period. No two individuals are completely alike, therefore treatment depends on your type of acne and skin type. Just as with any therapy, it is not possible to guarantee a successful result. 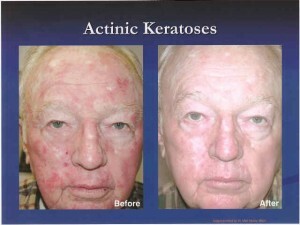 Levulan Kerastick® (aminolevulinic acid HCI) is part of a photodynamic therapy (PDT) system used to treat actinic keratoses (AKs). AKs are rough, scaly patches on the skin caused by excessive exposure to the sun. Sometimes AKs can develop into dangerous skin cancers. Estimates are that 40% of squamous cell carcinomas, the second leading cause of skin cancer deaths in the U.S., begin as AKs. An AK that has become larger and thicker is called “hyperkeratotic” and may progress to squamous cell carcinomas. Patients may notice increased redness, tenderness, itching, and burning of an AK. Since it can be almost impossible to distinguish an AK from a squamous cell carcinoma without a biopsy, The American Cancer Society, The Skin Cancer Foundation, and the American Academy of Dermatology recommend that people with AKs seek treatment for them immediately. Left untreated, squamous cell carcinomas may become larger, go deeper into the skin, and eventually spread to other parts of the body. This results in thousands of skin cancer deaths each year, many of which could have been prevented. PDT is unique because it is the only one that uses light to destroy AKs. It has been proven effective in clinical testing. Eight weeks after treatment, several studies have shown it had cleared up tp 100% of AKs in about 66 percent of patients. By preferentially attacking the active or abnormal cells, PDT combines a very high success rate with good preservation of normal skin without significant risks for scarring. Once the areas have healed following PDT, the areas are re- examined to see if additional treatments or possible biopsies are needed.PDT is special because it is a targeted treatment to preferentially target more rapidly dividing cells and atypical skin growths. With regular or traditional cryosurgery ( freezing with liquid nitrogen) or burning, only the visible pre skin cancers are treated thereby leaving ones that aren’t as apparent ( sub clinical or hidden) lesions undetected. 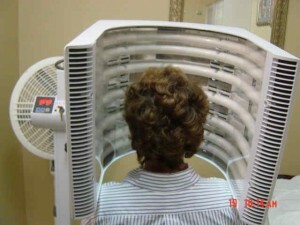 Photodynamic Therapy allows for field or blanket treatment of an entire area of sun damage thereby reducing the chance that undetected pre skin cancer cells will be left untreated.Photodynamic Therapy is usually scheduled in the doctor’s office because of the required photosensitizing prescription / physician applied medication and the special light activation equipments. Currently PDT procedures are generally performed with the patient waiting in the office during the 30 minute to several hours incubation time before the application of the light source. Depending on the area being treated and the recommended incubation time, different numbers of treatment sessions spaced 4-6 weeks apart may be required to achieve the desired improvement and reduction in lesions. It is not always possible to predict ahead of time how many treatments your specific condition may take or how you will respond to PDT. Photodynamic Therapy requires your patience and your willingness to follow the post procedure instructions, including staying out of the sun for 24-28 hours depending on the area treated and your physician’s requirements. The greatest advantage of PDT is the ability to selectively treat an entire area of skin damage and pre-cancers (blanket or field treatment). PDT generally decreases the likelihood of lighter or darker skin spots ( post-inflammatory hyper or hypo pigmentation) caused by routine freezing with liquid nitrogen. 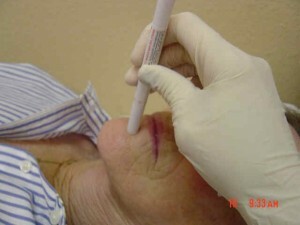 Additionally, PDT frequently may facilitate smoother skin and an overall improved appearance, tone, color, and enhanced skin texture.In several studies, PDT has been preferred by many patients for ease of use and recovery as compared to alternative treatments including freezing and chemotherapy creams like fluorouracil (Efudex). The PDT side effects may be milder with less down time than with fluorouracil.For patients with many skin lesions, PDT may be generally more effective than repeated spot treatment with topical liquid nitrogen. Some patients are unable to tolerate the prolonged treatment required with fluorouracil (Efudex) or imiquimod (Aldara) because of the irritation, redness, and possible downtime with these topical creams. You may not go out in the sun even with sunscreen for usually 24-48 hours after PDT especially after facial treatment. Arms, legs, chest or back PDT may be much easier since you can wear high SPF protective clothing and sunscreen to protect the areas during the post-procedure period. The best candidates for PDT may be those with lighter or fair skin with sun damage.You may not be a good candidate for Photodynamic Therapy if you have darker skin that tends to turn brown or discolor with certain light or laser treatments. You may also not be a good candidate for PDT if you are very sensitive to light, burn extremely easily, would be unable to stay out of sunlight for the required 24-48 hours, or on taking medications which may make you very sensitive to sunlight or light based therapies.Your decision on the best treatment choice may depend on different factors such as the location and type of skin lesions, your past treatments, your overall health, and level of comfort. Your physician can help you sort through the different treatments and assist in your shared decision making process. However, the right decision for you is always yours and your doctor’s to make. PDT may also not be very useful for more advanced skin cancers like morpheaform or sclerosing basal cell carcinoma, moderately to poorly differentiated squamous cell carcinomas, recurrent tumors (tumors that were previously removed and have re-grown at the same site, or lesions in previously radiated (x-ray or radiation treatments) sites, and malignant melanoma. As with any surgery or procedure, Photodynamic Therapy is associated with some possible minor risks and complications. While it is overall a very safe and effective minor in office treatment, there are some possible uncommon complications. Since an exaggerated light sensitive reaction is expected by definition of PDT, most patients understand and expect some type of a sunburn or red reaction after skin PDT. Not everyone gets a sunburn reaction and in fact some patients may have no visible reaction or redness.Possible risks and complications of Photodynamic Therapy include (but are not limited to) burning, skin discoloration, skin redness, broken blood vessels called telangeictasia, pain, infection, cold sore (Herpes) activation, blisters, scabs, unsightly scar, keloid (raised, thick scar), cosmetic disfigurement, skin discoloration, eye injury or swelling, allergic reactions, reaction to topical anesthesia, pre-cancer or cancer recurrence, need for further treatment including biopsy, radiation or plastic surgery, and rarely death. Acne may need additional treatments and may not respond at all or sustain a long lasting response to the treatment. The main goal with Photodynamic Therapy is to reduce the number of pre-skin caners and thereby potentially decrease the chance of future skin cancers. It is important to understand that as with any medical treatment, there are alternative treatments and options to PDT. You may want to discuss alternative treatment options with your doctor at your consultation appointment.There are many options for treatment of actinic keratosis (AK’s) including but not limited to freezing (cryotherapy or cryosurgery), burning, chemical peels, lasers, chemotherapy creams like fluorouracil or Efudex, immune modulator creams like Aldara (Imiquimod), local radiation , plastic surgery, curettage and desiccation (scrape and burn), surgical removal, no treatment, and other choices depending on the skin condition. In acne, there are many alternatives to PDT including oral Accutane (Isotretinoin), oral antibiotics, topical washes, acne facials, and many acne creams. Patients are advised to wear comfortable casual clothes and bring a wide brim hat for facial or scalp treatments. You should bring gloves or a long sleeve shirt if having hands or forearms treated. In nearly all cases, patients are usually able to drive after most procedures and do not necessarily need a driver unless they feel uncomfortable or have taken any sedative medications.Since you will be in the office for generally at least one hour (and sometime more), you may want to bring some personal snacks, drinks, and reading or knitting material. Personal music headsets or Ipods may also provide relaxation and help pass time during your PDT application, incubation time, and treatment.Most patients continue all doctor prescribed medications including aspirin and any blood thinners unless specifically advised otherwise only by the PDT physician. While there is no absolute contraindication, smoking may be discouraged for at least a few days before and 1-2 weeks after your procedure. As with any procedure, smoking can slow down wound healing and cause an increased risk of wound infections.Heavy alcohol use is not advised at least a few days before PDT. Heavy alcohol use can cause more bleeding and thin your blood. An occasional glass of wine or small cocktail may not cause severe bleeding.Your physician will want to know of any factors that may affect your surgery or wound healing. Usually not much. No two individuals and their skin is exactly the same and therefore individual reactions and tolerance to discomfort levels vary. Most patient report mild skin irritation including minimal to mild dryness and tight feeling of their skin after PDT. This discomfort is usually improved with frequent application of bland topical emollients or plain Vaseline.A small number of patients may actually complain that they felt nothing and didn’t have any pain or peeling. Less commonly, a small percentage of patients for various reasons may have significant pain, a very exaggerated sunburn response, moderate overall discomfort, and pain from the tightness and warmth of the skin.If there is pain, many patients find that they prefer to take something for pain at the first hint of discomfort instead of waiting until the pain builds up to an unbearable level. If you have mild or moderate pain, your doctor may advise you to take Tylenol (Acetaminophen) or another pain reliever over the counter. Rarely, prescription pain medications may be required for severe pain.Your physician will let you know what pain medications are recommended for your specific condition. Mild to moderate redness and or swelling is not uncommon the 1st day or two after PDT and can be lessened by use of an ice bag, ice cubes or chips in a small Ziplock baggie, or frozen peas in their bag. Applying cool packs or ice use every 5-15 minutes every hour for the first 8-24 hours after your procedure may be very soothing. Swelling may be more common for procedures around the eyes or lips. Sleeping propped up on a few pillows or in a reclining chair may help decrease swelling after treatment of the head and face area.Your physician should be notified of any infections, cold sore outbreaks, extreme swelling, or other unexpected reactions. Rarely, a visit to the physician’s office may be necessary for severe swelling or infection. Oral antibiotics, cortisone creams or pills, or other medications may be required for adverse reactions. Your physician will need to know if pain is increasing after 1-2 days after your procedure or if you are having fever or other concerning symptoms. In such cases, you may need to be seen at the physician’s office. While PDT is a very effective treatment, there is a reasonable chance that you may continue to need periodic treatments for pre cancers depending on your individual sin and severity of prior sun damage. 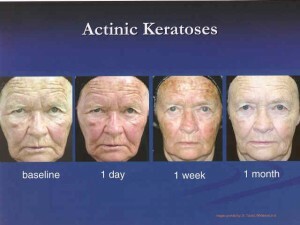 Often there are layers of underlying sun damage from prior years that rise to the surface over time. 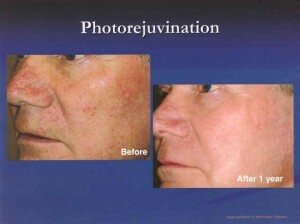 Photodynamic Therapy clearance rates have been reported as high as 60-90% with even one treatment. Additional treatments are advisable for patients with multiple lesions or hard to clear areas.It is important to understand that very few treatments or surgeries have a 100% cure rate. A skin pre-cancer or cancer may recur or a new cancer may arise in the same or adjacent area even after Photodynamic Therapy or other treatments. Some skin pre- cancers are more aggressive than others and need additional treatment and closer follow up. Skin sun damaged skin frequently needs additional follow up and possible further treatment, at least annual rechecks and possible touch up PDT treatments are advised. Several studies have shown that Photodynamic Therapy tends to have a cure rate comparable to the gold standard treatment with Efudex (fluorouracil). There are many good and effective ways to treat skin cancers. Depending on the type and location, options may include Mohs surgery, local radiation (X-ray) treatments, curettage and desiccation “C&D” ( scrape and burn), cryosurgery (specialized deep freezing), photodynamic therapy, regular surgical excision, plastic surgery treatment, interferon injections, laser removal and surgery, and several prescription creams including Aldara (imiquimod) and Efudex (fluorouracil). Copyright © 2003-2008 The Skin Center. All rights Reserved.